Ryanair's last scheduled weekday morning flight from Newquay to London left Cornwall on Wednesday. The airline is halving its Newquay to Stansted schedule in protest against a £5 departure tax by the county council to fund the airport's redevelopment. The airport faces massive uncertainty over its future after the MoD decided not to base its new fighter, the Joint Combat Aircraft, in Cornwall. 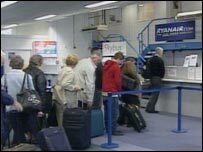 Ryanair will continue its evening flight from Stansted to Cornwall. Ryanair said it had had a very good relationship with Newquay Airport, but that changed when the county council decided to apply the £5 tourism tax. Ryanair Head of Communications Peter Sheerard said: "What the council is failing to recognise is that our customers are choosing their destinations more often than not on the basis of price. "So if the price to Newquay increases by £5, it makes it very uncompetitive and people will simply choose to go elsewhere, making the flights unviable. "It has to be based on low costs to sustain the service throughout the difficult winter months, and taxing tourists is not the way forward. "The council should be doing what it could to reduce taxes and welcome tourists." Ryanair also warned it could cut its Newquay service even further. Cornwall County Council said Newquay Airport had grown considerably in recent years and would continue to do so, which was why it had already started its £2.8m expansion programme to accommodate the expected growth. It said part of the funding for this had come from investment through Objective One and also from the Department of Transport, but that the £5 Airport Development Fee from each passenger would be used to help meet this and other costs of further airport developments and improvements. It added that it also believed that the majority of the airport's users realised the need to introduce the fee and supported the decision.